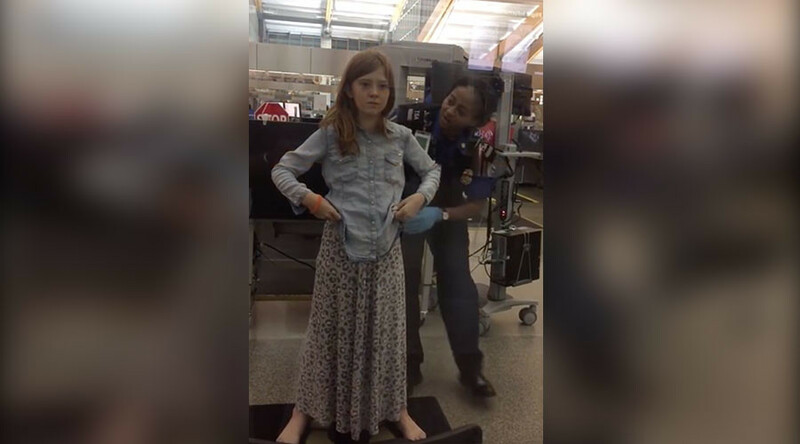 A young girl’s father was outraged after a TSA agent patted her down for nearly two minutes at an airport. The search was initiated after agents found a juice pouch mistakenly left in a carry-on handbag. The frisking happened last week in North Carolina and the girl’s father recorded the incident on his smart phone. Kevin Payne and his daughter, Vendela, were heading home to San Diego by way of Raleigh-Durham International Airport, when Transportation Security Administration agents discovered a Capri Sun juice pouch. Liquids exceeding three ounces are not allowed in carry-on bags for fear that they might contain explosives, and so TSA agents initiated a pat down followed by an hour of extra screening. Payne said that TSA agents told him he wasn’t allowed to film, but he recorded the incident on his smart phone anyway, and has since posted the video on YouTube and Nextdoor. His daughter said she kept herself together because she didn’t want to “throw a tantrum like a one-year-old,” according to KNSD. "I know it's to keep everybody on the plane safe, but she kept patting me down," Vendela said. "It was like, over and over." The Payne family made it on to their flight, but only because their plane was delayed. The TSA's website says screening procedures are been modified for children under 12. They will have a reduced likelihood of being patted down. How exactly screening procedures are being modified is not being detailed due to security issues.